The rules: Don't hurt anybody. Don't steal from anyone who doesn't deserve it. And play the game like you've got nothing to lose. Are you in or out? George Clooney, Matt Damon, Brad Pitt, Julia Roberts and Don Cheadle return as the coolest gang of hustlers ever. This time their targets are Paris, Rome and Amsterdam, and Danny’s ex-wife, Tess (Roberts), joins the team, adding one to make it Ocean's Twelve. 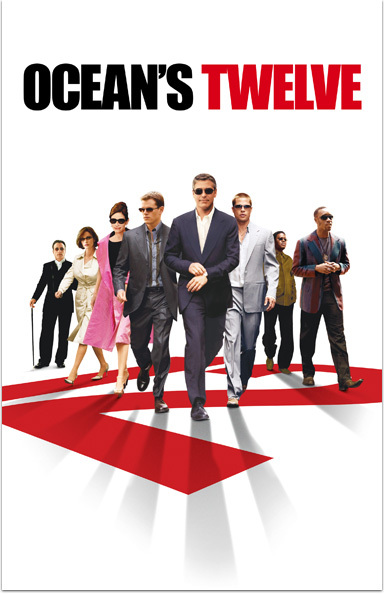 OCEAN’S TWELVE © 004 Warner Bros. Entertainment Inc. All Rights Reserved.